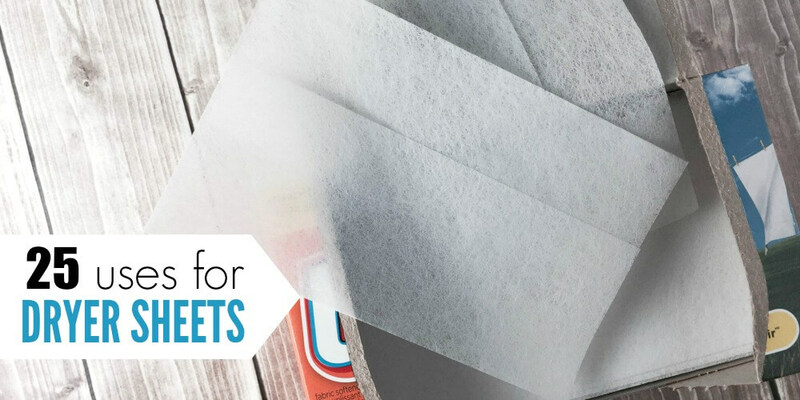 If you like finding alternate uses for things, you are going to love this post full of 25 uses for dryer sheets. Give these ideas a try and let us know what you think. Many of them will help you save some extra cash. Do you ever take the used dryer sheet out of the dryer and wonder, “What else can I do with this instead of throw it away?” Ok, maybe you don’t, but I do. I just have this need to reuse as many things as possible. If there is an alternate use for it, I love to find out and then give it a try. Some of these suggestions are for new dryer sheets, but most of them are for used dryer sheets. 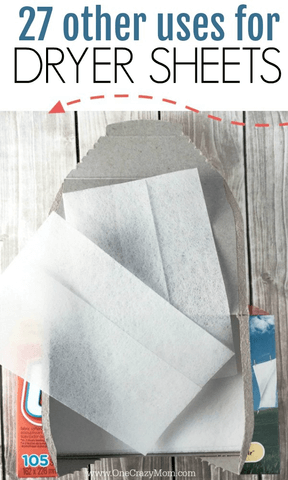 Try these clever uses for dryer sheets! 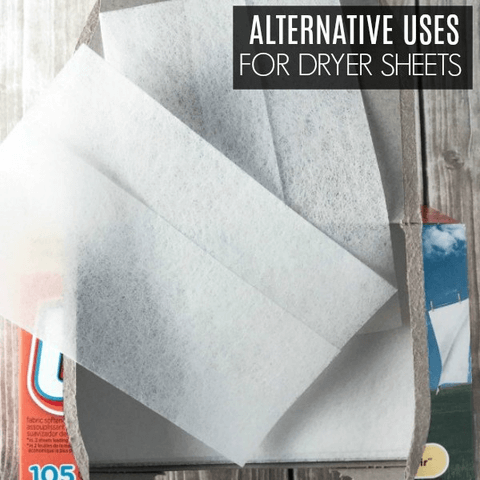 What can used dryer sheets be used for? 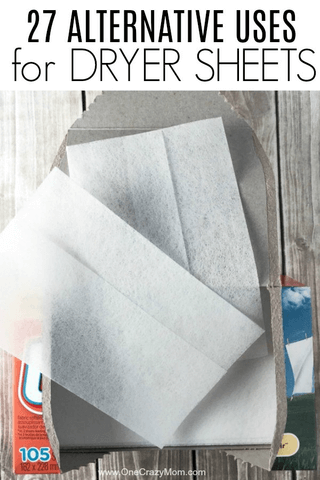 Let’s learn 27 uses for dryer sheets that might surprise you! They will definitely save you money. Well, of course, you say, this is what they are designed to do. Yes, I know that, but did you know you can use dryer sheets to fight static in other ways, too? Don’t you just love it when you put on a shirt or skirt and it just clings to you? No? Me neither. Next time this happens, just rub a dryer sheet on the inside of the clothing to help remove static. Here is another anti-static tip – rub a dryer sheet on your hands before you open up a package with styrofoam packing peanuts. No one likes those little stinkers sticking to them! If you have a drawer in your dresser or a gym bag that needs a little extra freshening up, throw in a used dryer sheet. You’ll only need one or two to do the trick. It will leave your bag smelling good. Are dryer sheets good for dusting? Yes! Used dryer sheets are great for dusting anything from table tops to baseboards. The static reducing qualities in the dryer sheet will also help repel dust so surfaces will stay dust-free for longer. One of my favorite uses for dryer sheets is dusting blinds. Don’t mistake what I just said, I do NOT like dusting blinds, but when I dust with a dryer sheet, they seem to stay clean for a bit longer, which means less dusting for me. Yah! Once I learned how to clean blinds with dryer sheets, it’s much easier! The next time you look down and really you have pet hair on your clothes, reach for a used dryer sheet. Just rub the dryer sheet over the pet hair and you will be able to easily remove it. This works great on furniture, too. Whether your windows have smudges or your eye glasses have fingerprints, used dryer sheets do a remarkable job at cleaning glass. Just rub the glass lightly with a used dryer sheet and any dirty marks will be cleaned off easily. Just be sure to only try this on glass. Dryer sheets can and will leave scratches on plastic. In the spring time, sometimes pesky critters can find there way from the outside into your home. Simply stuff used dryer sheets in any locations around your home where those critters may be able to enter. This is one idea I have not yet tried, but I will definitely be giving it a shot this summer. Place a dryer sheet in your pocket or around a belt loop and this should help keep the bugs away. There is no need to rub this on your skin, just keep it on your person. Please let me know if you’ve tried this one. I love old books. I don’t know what it is about them, but they just fascinate me. If you have some vintage finds, you may also have a vintage smell. Place a few used dryer within the pages of an old book and then, put the book in a zip top bag. Let this sit for a few days and you’ll ditch that not so nice smell. If you have a pair of scissors that are just not cutting like it used to, try rubbing down the blades with a used dryer sheet. This does a grab job at reducing any gunk that may have accumulated over the life of the scissors. Ok, maybe shoes aren’t exactly “fresh”, but if you want to keep stinky shoes at bay, simply keep a used dryer sheet in your shoes. Yes, I know, for some of you that might be a lot of dryer sheets, but over time, you will accumulate enough of them. You were just going to throw them away anyway, right? This is a great tip for shoes that you don’t wear often. Whether you have a real wood burning fire place or you are planning an outside overnight excursion (also know as camping), try a fresh approach to your fire starting. Stuff a few used dryer sheets into an empty toilet paper roll and use that to start your next fire. Not only will this burn well, but it will smell great doing it. Win-win! Get rid of that yucky trash can smell by placing a used dryer sheet at the bottom of your trash can before you replace the trash bag. This will help keep your trash can from developing that not so nice trash can smell. You can change out the dryer sheet as often as you need to, about every 4-5 trash bag changes works for us. If you just spilled some dry goods – think flour, sugar, powder, etc – try wiping it up with a used dryer sheet. The tiny dry particles will stick to the dryer sheet, making clean up a breeze. If you like to sew, but don’t like your thread getting tangled, try running a used dryer sheet over the thread before you begin sewing. The static fighting properties of the dryer sheet should help keep the thread tangle free. You shower. You deodorize. You get dressed. You notice that you have deodorant stains on your shirt. Noooo! Next time this happens, gently rub the deodorant marks with a used dryer sheet. You will see the deodorant lift from your clothing. Yah! Removing paint from paint brushes can be difficult. The next time you need to clean your paint brushes, leave them to soak in water with a dryer sheet in it. Let your paint brushes and the dryer sheet soak for a little while. Once you are ready to remove the paint, it will come off very easily. You know the feeling. You cook up a delicious meal, but you don’t quite make it back to the kitchen right away to clean up the dishes. When you do make it to the kitchen dinner is more than stuck on those pans! Fill your pan with water and place a used dryer sheet in it. Let it soak for about 30 minutes. When it comes time to “scrub” the pan, you will be amazed at how easy it will be clean your pan. Camping is fun! When it comes time to dusting off the tent and sleeping bags though, you may notice a bit of a musty smell (depending on how long your items have been stored). To prevent the musty smell from taking hold, the next time you pack up your camping gear, add a few dryer sheets. We put a few in each sleeping bag and a handful in the tent while we are rolling them up. When you get them out next camping season you will be pleasantly surprised that it smells fresh. Try adding a used dryer sheet to the bottom of your vacuum bag. When you vacuum, the air will automatically be pushed through your vacuum (and the dryer sheet) and you will freshen every room as you vacuum. If I have one, I like to add a used dryer sheet every time I vacuum. You can never have too much fresh, right? If you are tired at looking at (or through) the soap scum on your shower door, try this – grab a used dryer sheet and “scrub” your glass shower door with it. You will be pleasantly surprised at how well one small little cloth can clean! If you have a lot of stubborn soap scum, you may have to use a few dryer sheets and a little elbow grease and warm water. Wipe down your chrome with a used dryer sheet and you will have it spot free and sparkling in now time. This works great on all types of chrome – on your vehicle, in your home and everywhere in between. No one likes having crusty bug guts on the front of their car. Unfortunately, if you drive, this is impossible to prevent. If you have a bug issue, gently rub a used dryer sheet over the buggy area on your car. The dryer sheet is abrasive enough to unstick those bugs, but gently enough to not damage the finish on your car. If you have a baby, you surely have had to change a stinky diaper and not had a place to dump it. Throw some used dryer sheets into your diaper bag. The next time you have to change a stinky, add one of the dryer sheets to the diaper when you wrap it up. This will not eliminate the stinky-ness altogether, but it will certainly help take the edge off. You love your new shoes, but not the squeakiness that comes with them! If you have a squeaky shoe problem, rub a dryer sheet along the bottoms of your shoes. This should help with the squeaking. Be careful though, your soles might be a little more slick. We love the beach. No, we don’t live by the beach anymore, but we visit any chance we get. What we don’t love about the beach is the endless amounts of sand we continue to find weeks after we’ve left the beach. The next time you head in from the shore, try dusting yourself off with a used dryer sheet. The sand ever so nicely clings to the dryer sheet (and not your legs). I wish I would have know this when I was younger! Add a used dryer sheet to the bottom of your pot the next time you decide to do some planting. The dryer sheets will prevent you from losing precious soil out of the bottom of your pot (plus it won’t interfere with drainage). Over time, the base plate of an iron can develop some unsightly stains. The next time you want to clean your iron, turn it on the lowest setting possible, and then iron it over a used dryer sheet. Depending on the amount of build up, this may take more than one dryer sheet. Who knew there were so many other uses for dryer sheets! There you have it! 27 Uses for dryer sheets. Before I started writing this for you, I maybe had 10-12 ideas in my head, but after a little research I was able to expand upon that. I am really excited to share these ideas with you and I hope you’ll find them useful. Let us know your favorite alternative uses for used dryer sheets. What have you tried and loved? Come back and share your ideas with us. We’d love to hear from you! What can be used in place of dryer sheets? Liquid fabric softener can be used in place of dryer sheets when drying clothes. You can also use vinegar in place of liquid fabric softener in the washing machine. If you would rather use dryer sheets but want to save money, try making Homemade Dryer Sheets. It’s very simple to do and they work great! Now you have know what to do with used dryer sheets! One of my favourite uses for spent dryer sheets is for litter box cleaning. We live in an apartment, so we use a diaper pail to temporarily hold dirty litter until we can take it out with the trash. Since the cat box (and the pail) are in the laundry room, it’s easy to just push the little button to lift the lid and throw a dryer sheet and the lint in there. Like the diaper bag tip, it doesn’t deodorize completely, but it takes the edge off and really cuts down on the ammonia smell! We used to tie drier sheets around our pony tails when we had practice or games for sports at school- i try to do this everytime i do any outside activities now too- sye goodbye to those straight-from-hell-eye-ear-mouth-bombing gnats!! !